“If you ain’t scared, you ain’t human.” Thomas wakes up, and the only thing he can remember is his name. He is in a place called the Glade, where the towering walls of The Maze surround him. Nevertheless, The Maze is the only way out. The next day a girl arrives, the first girl to ever arrive at the glade. And the note she holds in her hand is terrifying. Its reads, “EVERYTHING IS ABOUT TO CHANGE”. 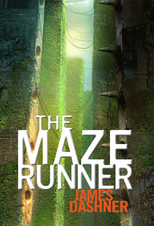 James Dashner’s The Maze Runner sucked me in with its mystery, suspense, and action. As the events inside the Glade become more and more mysterious, Thomas, the newbie, seems to be connected to these events in some strange and seemingly impossible way. Anyone who enjoys an action filled mystery will love this book. The author, James Dashner, combines the elements of survival with the dark and vicious horrors that await in The Maze, with a goal of cracking the the ultimate code. In this blood-thirsty book full of friendship and daringly bold sacrifice, there is no way the brilliant characters won’t find a solution to the maze. I was mesmerized with the feeling that I was inside the book, experiencing the events with the characters, and I even started to pick up on language they used. As the pressure builds, the tension that is mixed with fear will make your heart race to keep up.